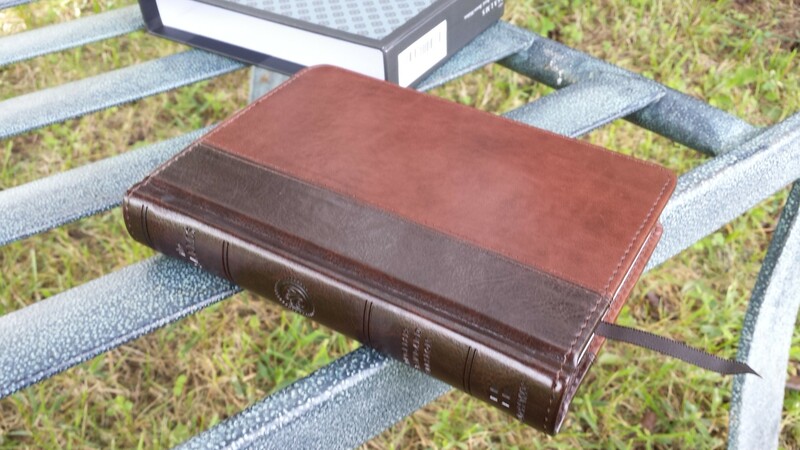 Most of the Bibles that I review are complete Bibles. I rarely read a stand-alone Bible book. Every now and then one comes along that makes sense as a stand-alone book. 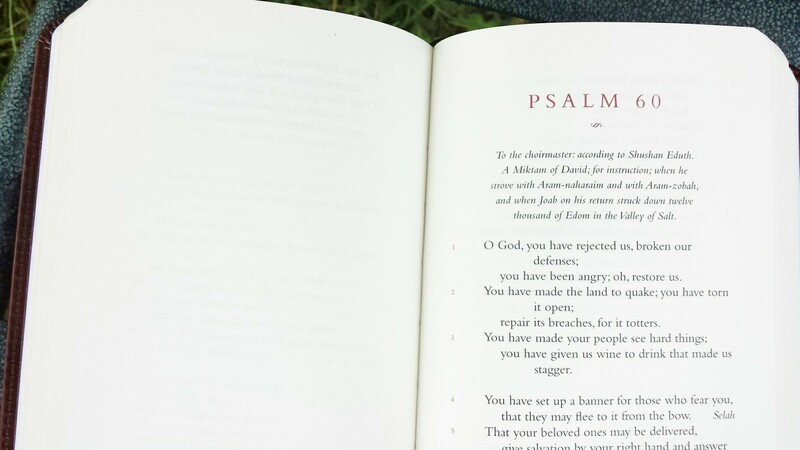 Crossway’s The Psalms is one such book. The edition I’m reviewing is brown and walnut TruTone over board and it has some impressive specs. This isn’t a basic hardcover. It’s a two-color TruTone, complete with perimeter stitching, over board. I love the texture and feel of the cover. I doesn’t look or feel like imitation leather. 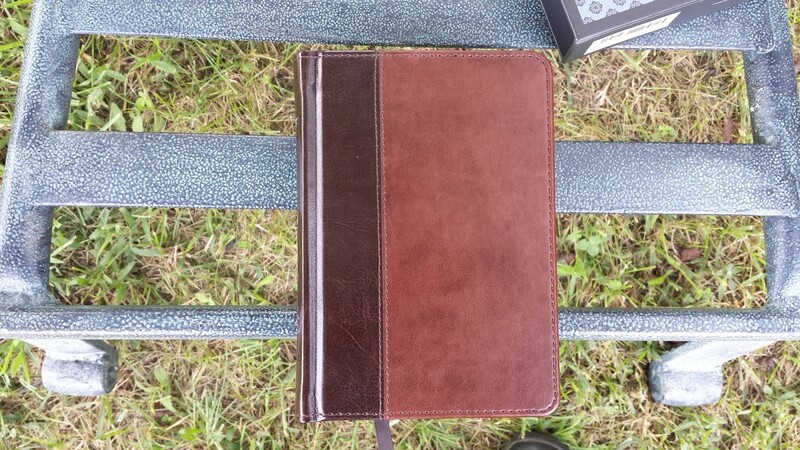 I would love to see other Bibles available with this exact cover. 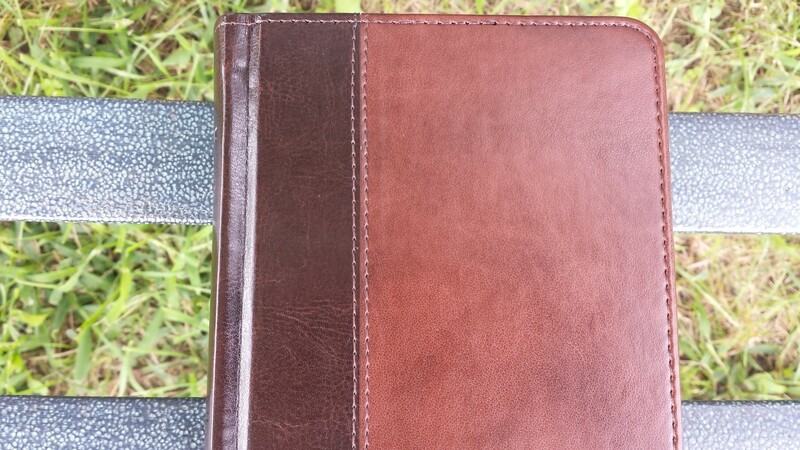 It has a brown paper liner that matches the cover and a sewn binding. 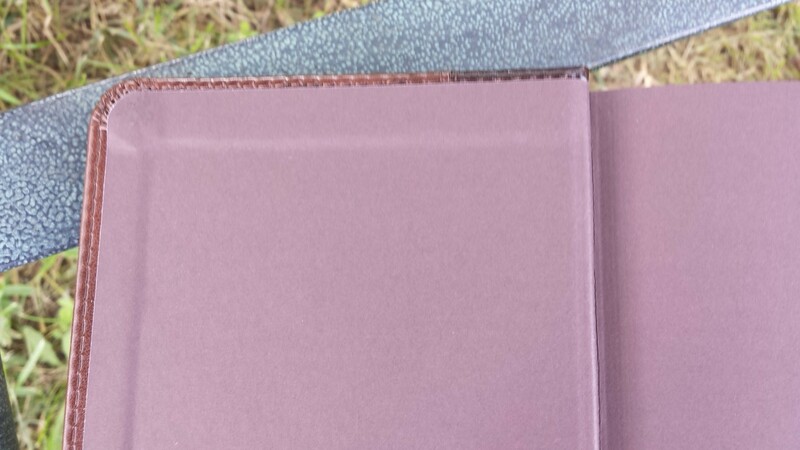 My only complaint about the binding is that it will not lay open on its own except for somewhere in the middle of the book. The size is 6.75 x 4.75 x 1.12. The paper is very thick at 80 gsm ivory woodfree. It has my favorite cream tone (I’m not a fan of pure white paper). It does still have some show-through but it’s not bad. It has line-matching to improve readability. There are a few pages that have some spots. I’m not sure what they are and it could just be my review copy. It isn’t enough for me to care, but I did want to mention it just in case. It does not have any gilting on the edges. Since this looks more like a book I think it’s better to not have the gilting. The font is a large print Bembo 11-point with 13-point leading (11/13). I love this font- especially the small letter ‘f’ and capitol letter ‘R’. They have a unique flare that gives it some style. It’s about a medium darkness and is very consistent throughout the book. 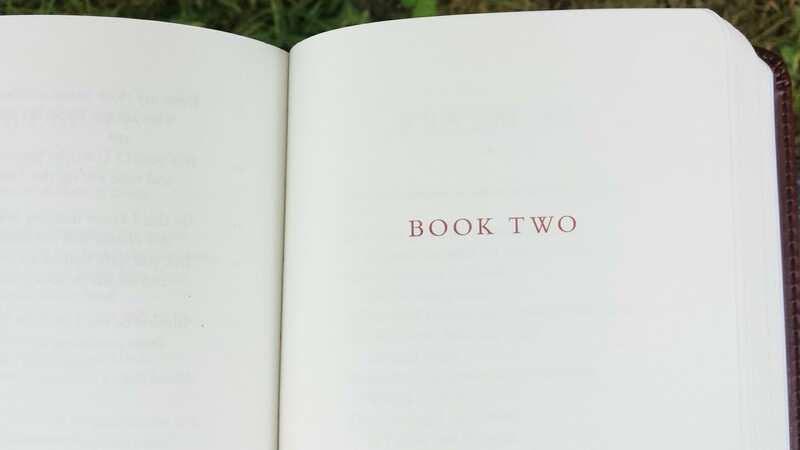 The chapter numbers and verse numbers are printed in a dark red. This is my favorite red for text. I would love to see this red used in red-letter Bibles. The text is a joy to read (I almost read the whole book in one week). The text is presented in single-column verse format. 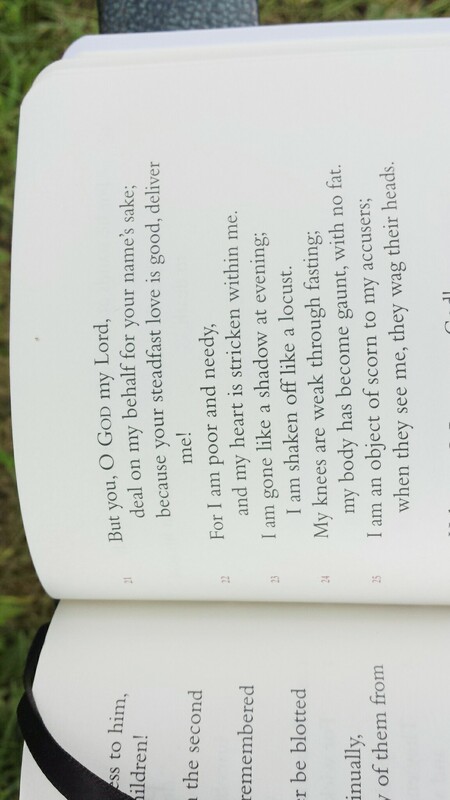 The verse numbers are printed to the left of the verses, far enough away to not be a distraction but close enough to know they go with the text. I was able to ignore them completely while reading (and I get distracted easily). Each chapter begins on a new page. Most of them start on the page on the right side, even if the page on the left side is blank. There are a few that start on the page on the left side. It doesn’t really make sense when it does this and it seems awkward because so many chapters start on the right side. There is nothing in the header. 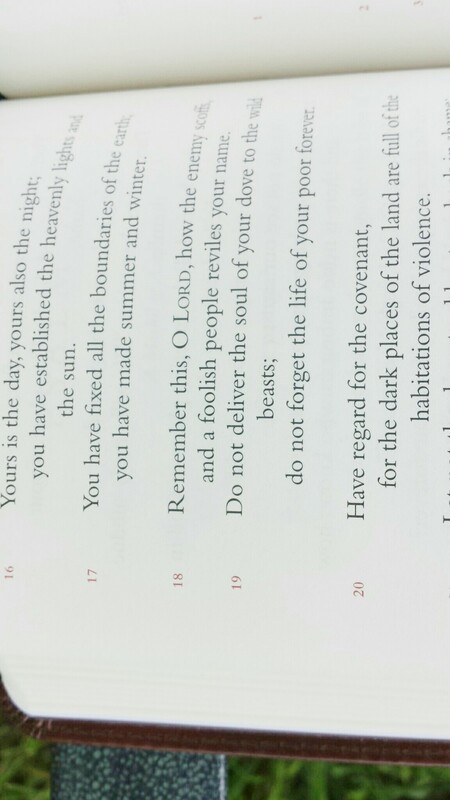 The footer contains the chapter number, ESV heading for that chapter, and the page number. The footer is laid out the same way on both pages. 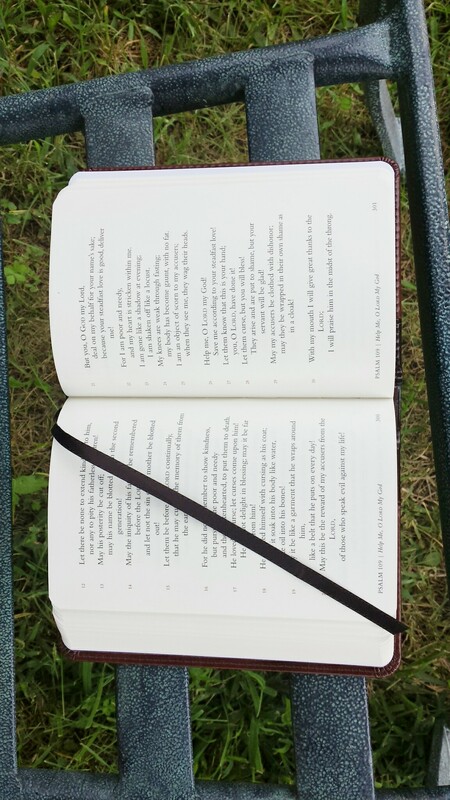 The page numbers on the right page are on the outer margin, while the left page has them in the inner margin. This seems a little awkward, but that’s because I like my pages to be symmetrical. I like having the headings in the footer. It’s different. They’re out of the way so they don’t distract from reading, but they’re still there if you want to see them. 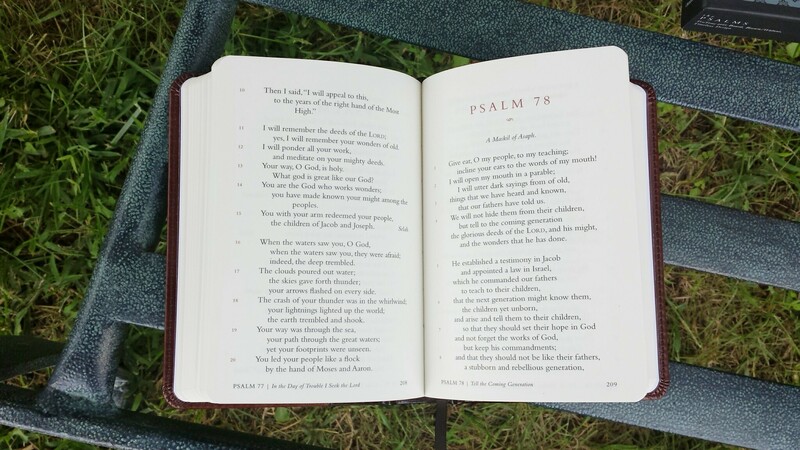 The book of Psalms itself is actually five books. There is a page with the book number (ex: BOOK ONE) before the chapter of that section of Psalms. In the front are a presentation page and a two-page excerpt from the preface to the ESV that talks about the ESV translation. There is a dark brown ribbon marker that matches the cover perfectly. It comes in a nice slipcase. 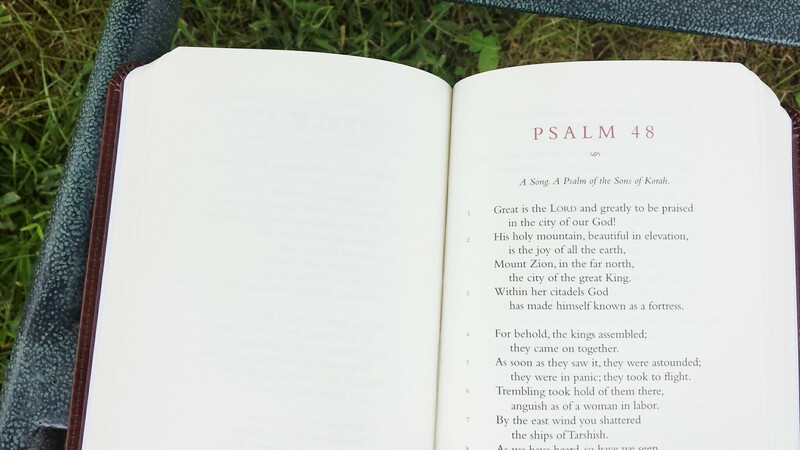 With The Psalms, Crossway has made a nice reader and a great argument for publishing books of the Bible individually. I would love to have the rest of the Bible published exactly like this. 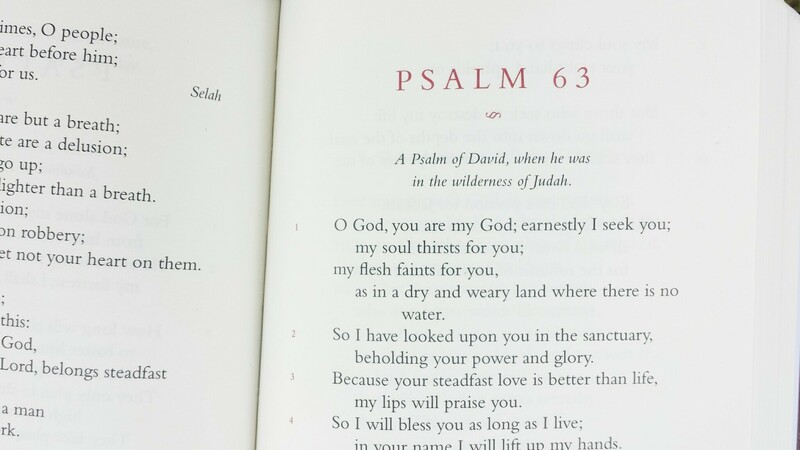 The Psalms is a joy to read and I can’t recommend it enough. Crossway provided this book free for review. I was not required to give a positive review- only an honest review. 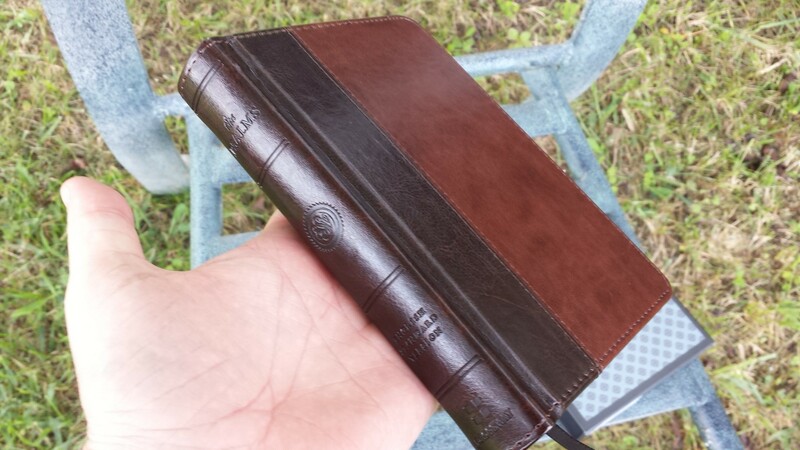 PreviousReview of TBS Windsor Text Bible in Black Calfskin. Authorized King James Version. Published by the Trinitarian Bible Society, London England. This is certainly an appealing offering, and you have done a fine job of reviewing it. 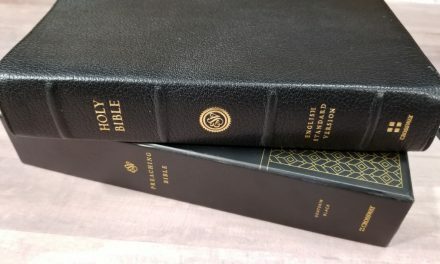 I have yet to investigate the ESV, and perhaps it is time I did so. For about ten years I used and carried the NASB in its first edition, and was reasonably satisfied with it, but ultimately returned to the Authorised for many reasons that I won’t go into here. I almost feel guilty for not even checking out a major translation, but I have mastered the vocabulary of the Authorised, and love its elegant language, and its historical appeal. I suppose I need to have on hand something contemporary for witnessing participating in lessons etc. Perhaps I will start with this offering, we’ll see, it is certainly appealing in your review. 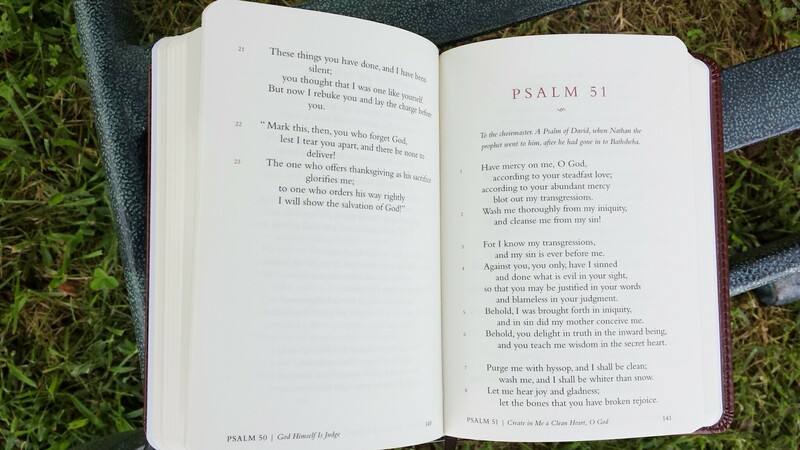 Interesting that Crossway did not set _The Psalms_ in Lexicon No. 1 like all of their other Bibles. I welcome that. I don’t particularly like Lexicon No. 1. It’s very heavy, particularly in large point sizes. I totally agree with you. 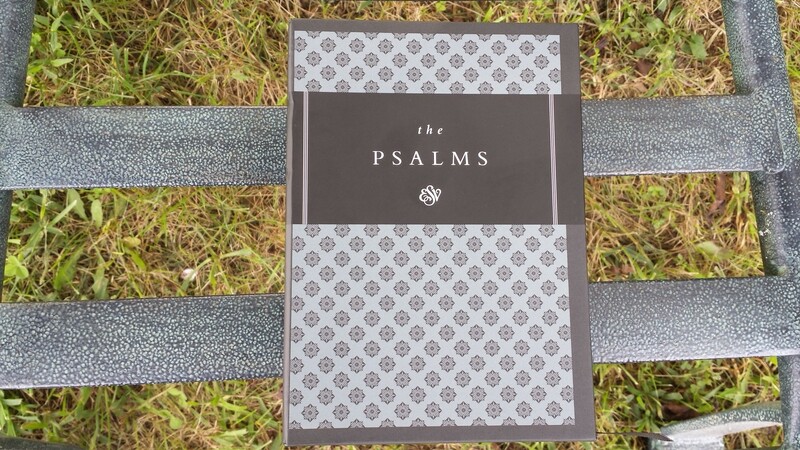 It is a joy to read the Psalms in this form and I could only wish the Proverbs were available in the same format. I do know it would make a great Christmas gift or a great gift for someone dealing with hardships. Hi Mike. Crossway did tell me they have more planned. I’m sure Proverbs is on the list. 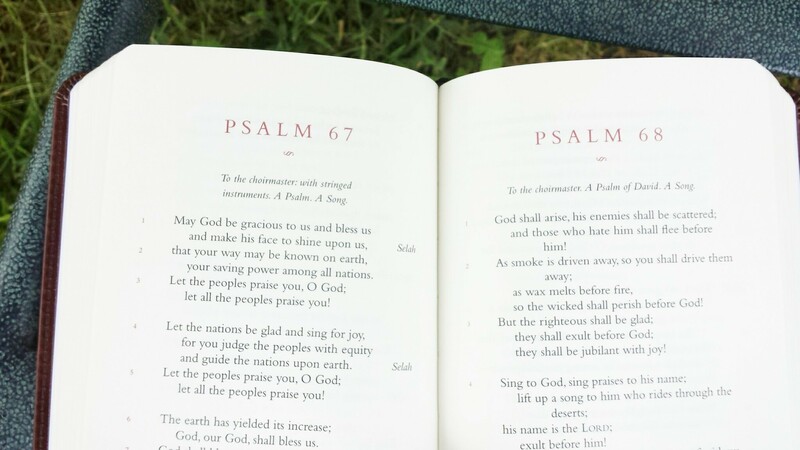 If only Lockman would get inspired to raise the bar and get creative… I would love to see the NASB translation of the Psalms in a lovely format and binding, printed in the U.S.